The weather in Florida has been incredible— hot during the day followed by cooler temperatures at night. I love the fact that I can have the best of both worlds by wearing my favorite dresses and skirts and then later adding a few layers for a nighttime look. The weather is also very inviting for leather, which makes me happy, because you know how much I love leather! When I wear this dress I love to emphasize the accessories by wearing extra rings and bracelets. OMGoodness, your accessories are rockin'. Love them all. Beautiful jewels! Especially,I like your earrings!! this is an amazing post! What a great outfit. that's a great shot of the accessories in the last pic. Very nice, love the accessories! 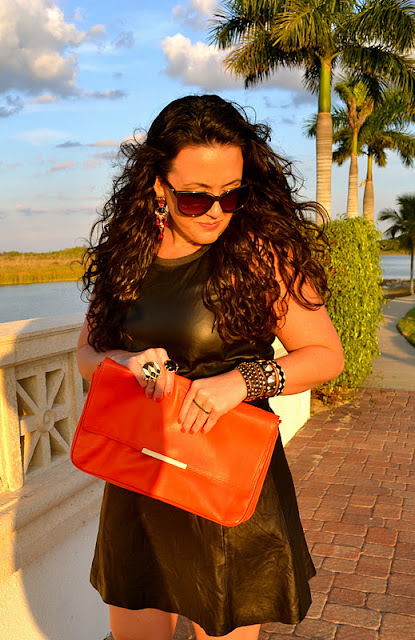 Hey I love your blog, your Arm Candy and your love for leather.. Check out my platform..when you get a moment and join if you like! the dress is hot and i love the accessories! orange is my fav color so that clutch is great!! Theory, Zara, Dannijo, girl you've got everything that I love! 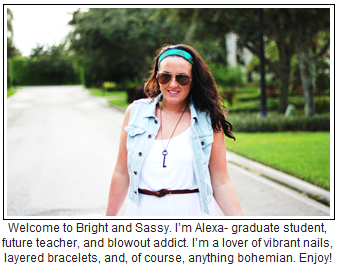 And I can definitely see why your blog is called Bright and Sassy ! ;) Everything just works! Lovely rings!!!! Especially the one with the stones!!! Come and visit if you like my blog we can follow each other? Great dress!! It looks so warm where you are and I am so jealous! I love all of your wrist swag too :) Fabulous outfit! Come visit the Glitterati.. we'd love a follow! Yes, it's a real Chanel tattoo btw! damn your clothing budget must be outta this world!!! Your so lucky, girl. I'm obsessed with your blog and I read it every morning. I love all you jewelry, so gorgeous !! you look stunning beautiful, dear !!! Nice photos as well. I love edgier looks... this is definitely my style and I love your dress!! Very dassy outfit! red and bkack is such a fabulous, vibrant color combo. 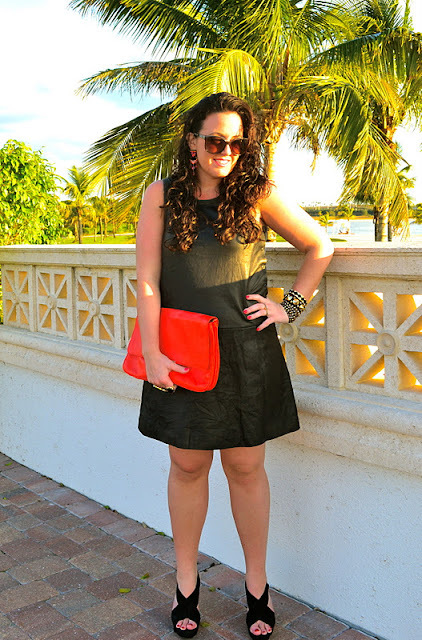 The leather dress looks great on you and adds some edge to your look. i like the rocker chic accessories, you carried the look so well. Nice styling! Hey Alexa! 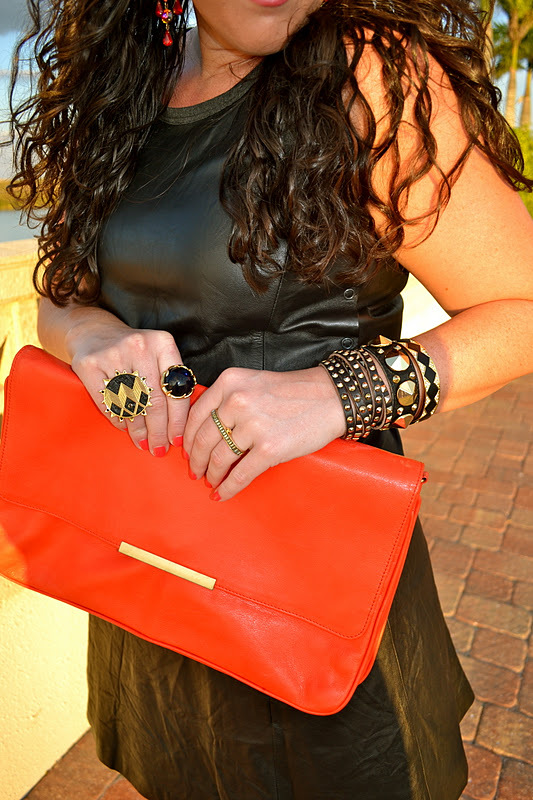 Adore this outfit, love the bright clutch & all your arm candy! I'm very jealous of your weather and that outfit is fab ! I'm loving your bracelets, and the color of your bag is divine! I would LOVE to get a peek into your jewelry stash! So many amazing pieces in just one outfit! Dannijo is definitely on my wish list. Love the MR Dannijo collection. Your accessories are amazing! And I'm very jealous of your Florida weather! i am definitely LOVING your jewels here! the bracelets are FABulous, as are those rings! i can never get enough of leather and spikes.